All our publications are free to read! Click on any magazine covers to access your favorite publication. Did you know that all WEB publications, come in a Native App versions to view on your phone or tablet? MEDIA BLENDER makes it even easier to read your favorite publications! 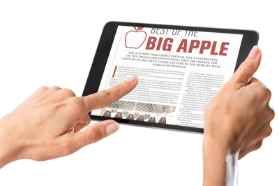 You can now read via a web browser, or better still, download for free the Native App version of the same title to get the latest edition and alerts from Apple App Store or from Google Play Store.